Tall plank, weight below head. 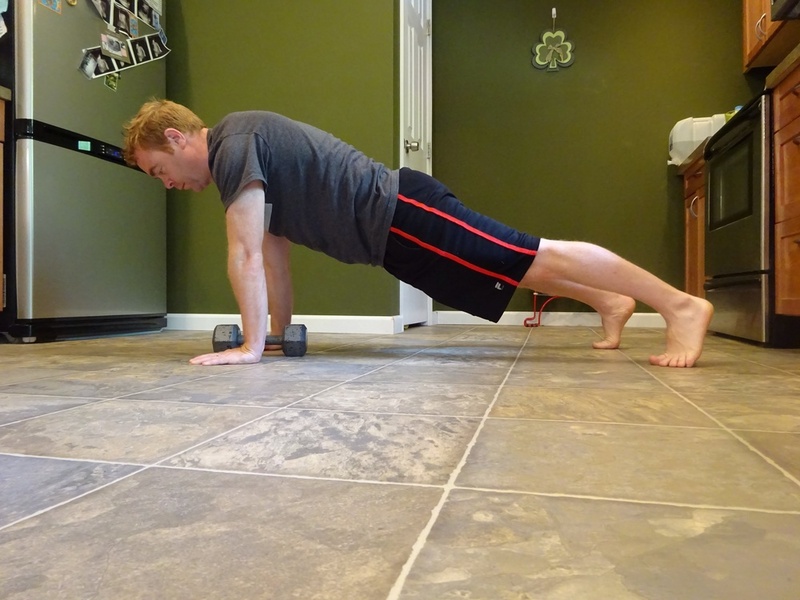 Begin in tall plank position, with the wight between hands. Lift one hand off the ground without tilting and pick up the weight. Lift the weight up, slowly, by pulling your elbow back towards your hip, so upper arm is right up against the side of your chest. Continue to pull the elbow up higher as far as you can, without tilting your torso. Pause briefly at the top of your range of movement and then slowly lower the weight back to it's starting point beneath your face. Place that hand back in the floor and repeat with your other arm. Do this with out tilting your torso on the switch over. Slowly return weight to floor and gently replace hand on floor. Hold on to the weight for your total reps if staying on one side for multiple reps. Do not let weight touch floor ibtol it's time to switch sides. Tip: Don't get too ambitious with the size of the weight today. If you dial in this movement with perfect form using a light weight, you will find you can lift heavier weights with great form far sooner than if you begin too heavy. For this reason, you do not need to state the size of the weight you choose to use today. Just pick something light but challenging. Refer back to Day 4 for the basics. 5 Rows with right, switch sides without tilting, repeat 5 rows. Drop to knees to break briefly and repeat 5 times. 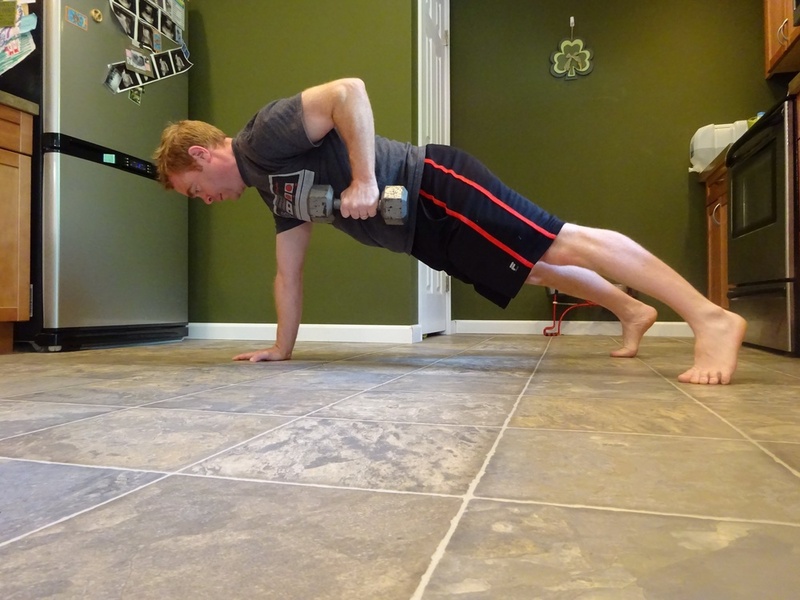 Dial in the basic tall plank at the beginning of each round and try to maintain it throughout the exercise. 5 pairs of Alternating Rows, switching sides after each row. Stop and take a break after 5 pairs. Repeat 5 times. Alternating Rows, for 30 sec x 4 times. Take as long a break as you feel you need I order to get through the next round with perfect form. Alternating Rows x 60 sec, x 3 times. 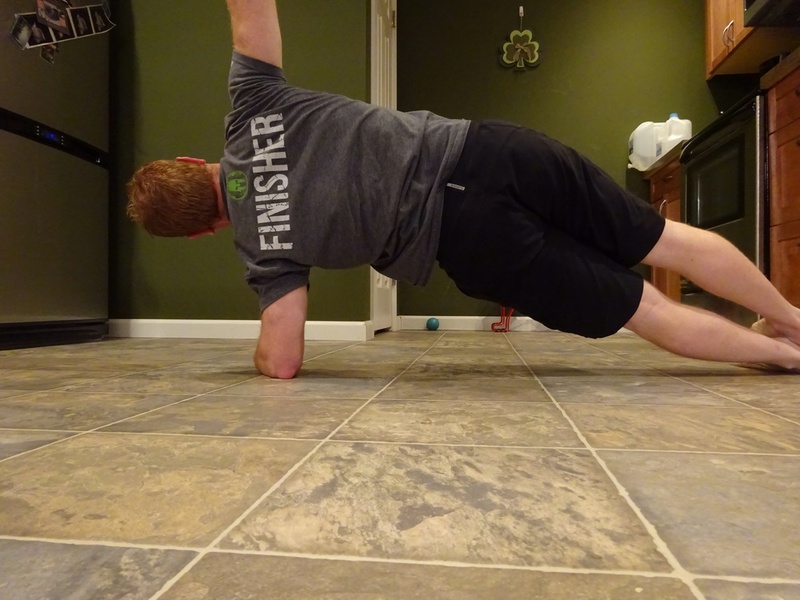 The Plank: Day 16/30, Side Plank Rotations. Begin in forearm plank. I like to position my arms so fists are close to elbows for this one. Slowly take the weight of one forearm, without tilting, rotate to one side so shoulders and elbows are stacked on top of each other. 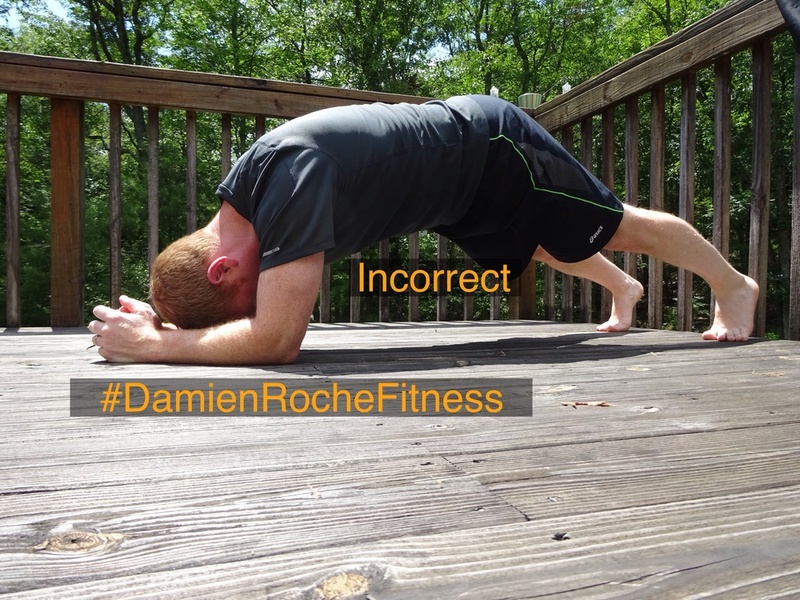 Control and quality is vital so only rotate as far as you can maintain a solid plank. Aim to stack shoulders and elbows above each other. And repeat to other side. Hips and shoulders rotate as a single unit. Do not allow the plank to fail while rotating. 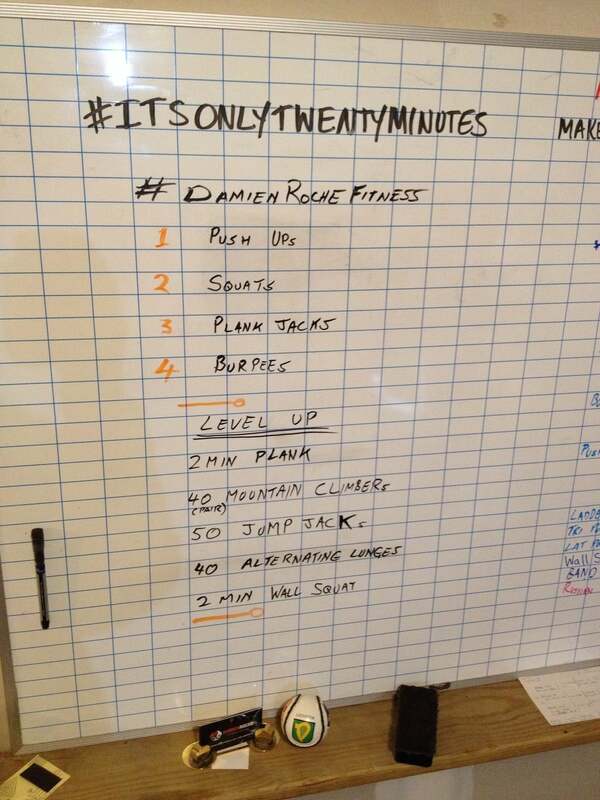 Aim for 45 sec of slow rotations, 20 sec rest, x 3 times. Take more rest time if needed to maintain a quality 45 sec. 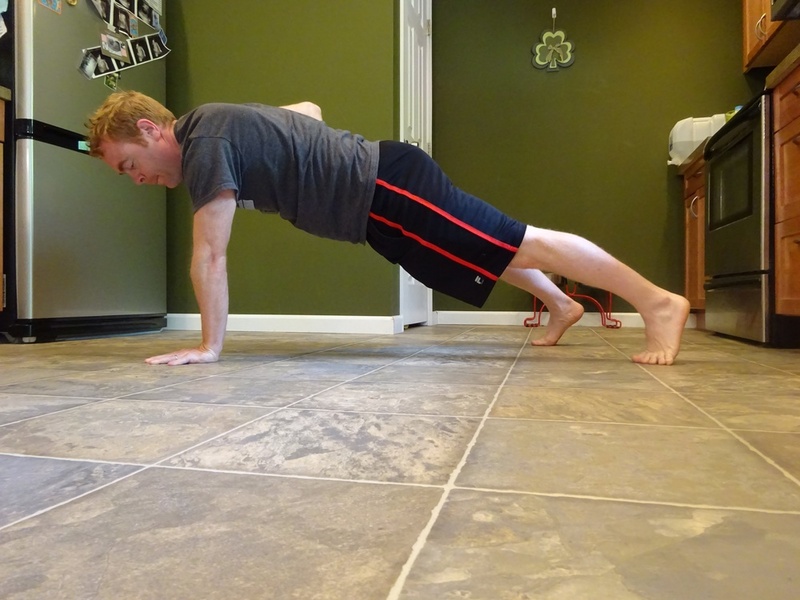 The Plank: 30 Days of Why's, How's & Challenges. Strength gains in the plank directly translate to improvements across a wide spectrum of other exercises from Push Ups to overhead presses. Having a strong connection between hips and shoulders allows for more efficient movements and power transfer to the limbs, reduced risk of injury and pain, especially involving the lower back. It won't hurt knowing that a stronger corset of core muscles can help loose a belt size or two just from holding everything where it should be. Weaker corsets can be pushed out by intestinal pressures increasing girth and bringing with it a host of potential health concerns. Lie flat on your stomach, place forearms on ground with elbows under shoulders, raise body off ground and maintain a straight back, head in line with spine and eyes focused on in a point on the ground just in front of your hands. Join hands together and press gently into the ground to spread the load away from elbows. Tighten the abdominal and core muscles. Engage the muscles you feel contracting each time you cough. A cruder but far more effective explanation.... try cutting of your urine mid flow..... these are the muscles you want engaged while you plank, for the entire duration of the plank. Once these muscles fatigue and fail, your plank is over. Do not allow other body parts, especially the lower back, to pick up the slack. It is this group of muscles that we are trying to strengthen over the next 30 days. Holding breathe or shallow breathing near the end. Even with perfect body alignment, you can relax the corset muscles. When this happens the hips slowly drop but the lower back muscles take over and are used to keep hips in line. 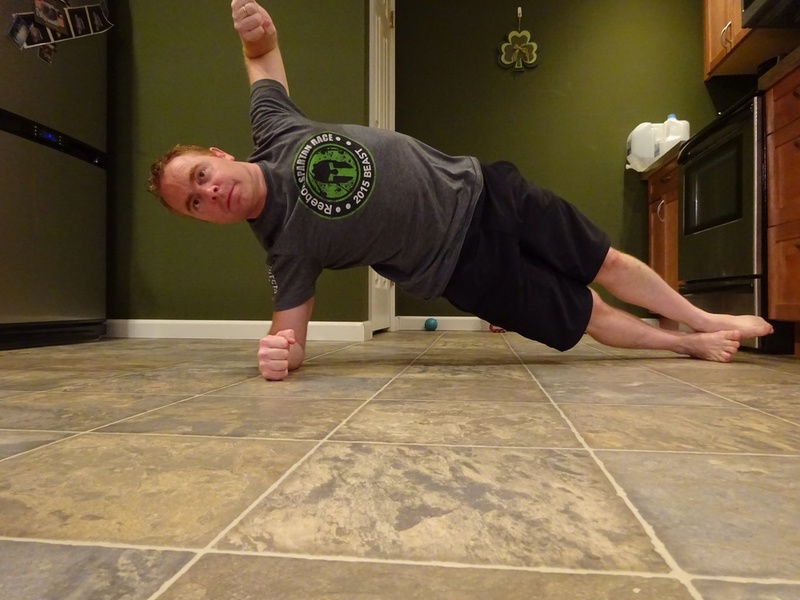 At this point you are no longer holding your plank so tighten up or drop. 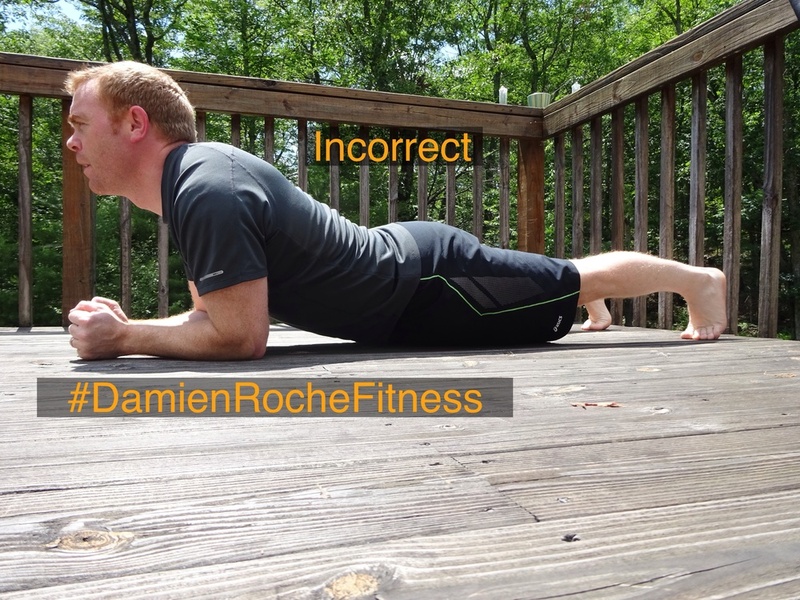 Increases in your timed plank are worthless and possibly dangerous if not done correctly. Note, and let us know, your result and your thoughts.